Thermocouples are two wires of dissimilar metals, joined at one end. Changes in the temperature at the “hot junction” (measuring end) induce a change in electromotive force (emf) at the “cold junction”, where it can be input into a controller or indicator. As the temperature increases, this output emf also rises, though not completely linearly. Thermocouples can measure temperatures over wide ranges, fairly inexpensively. They are very rugged, but they are somewhat less accurate vs. RTDs and thermistors. United Electric Controls (UE) offers type J, K, E and T Thermocouple Terminal Head Styles as well as Beaded Thermocouple types: K, R, S & B. See product types below for more information or contact us directly at 617.923.6966. There are many different types of thermocouples. They are made of different types of wire and have very different properties, making one type better for a specific application than another. 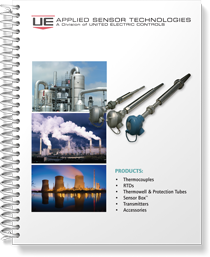 Below are descriptions of the types of thermocouples that United Electric Controls makes. The Iron – Constantan “J” curve thermocouple is the most widely used thermocouple; it is versatile and has a relatively low cost. It has a positive Iron wire and a negative Constantan wire and is recommended for reducing atmospheres. The operating range for this alloy combination is from 0° to 750°C (32° to 1380° F) for the largest wire sizes. Smaller size wire should operate in correspondingly lower temperatures. The Copper – Constantan “T” curve thermocouple, with a positive Copper wire and a negative Constantan wire, is recommended for use in mildly oxidizing and reducing atmospheres at temperatures from 0° to 350° C (32° to 660 °F). They are suitable for applications where moisture is present. This alloy is recommended for low temperature work since the homogeneity of the component wires can be maintained better than with other base metal wires. Therefore, errors due to inhomogeneity of wires in zones of temperature gradients are greatly reduced. The Chromel™ – Alumel™ “K” curve thermocouple is often used at high temperatures. It has a positive Chromel™ wire and a negative Alumel™ wire and is recommended for use in clean oxidizing atmospheres. The operating range for this alloy is from 0° to 1250° C (32° to 2280° F) for the largest wire sizes. Smaller size wire should operate in correspondingly lower temperatures. The Chromel™ – Constantan “E” curve thermocouple has the highest emf of all standard thermocouples. It has a positive Chromel ™ wire and a negative Constantan wire and is recommended for use in oxidizing, inert or dry reducing atmospheres or for short periods of time in a vacuum. These elements must be protected from sulfurous and marginally oxidizing atmospheres. Type E thermocouples can be used for temperatures from 0° to 900° C (32° to 1650° F). 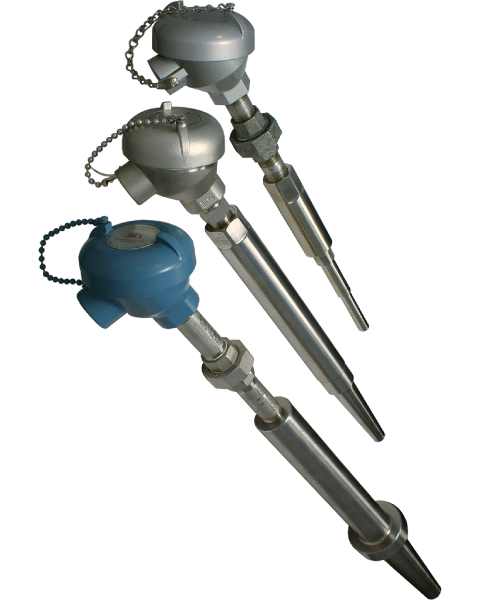 GP – General Purpose thermocouples that are comprised of a pair of thermocouple wires inside a tube. These are used to measure temperatures of 260° C (500° F) or less. MI – For higher temperature applications, a Mineral Insulation can be added in the tube. For UE MI thermocouples compressed magnesium oxide is added inside the tube. These are used to measure temperatures of 260° C (500° F) and higher. BTC – Beaded thermocouples are mainly used in furnace applications.